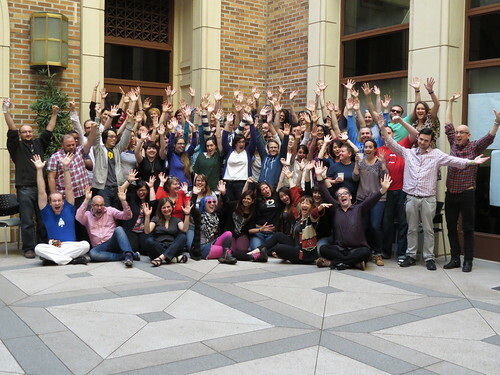 Three weeks ago, I traveled from Chattanooga to San Francisco to join my Mozilla colleagues for my first All Hands, the annual gathering of all Mozilla Foundation employees. For one week each year, our distributed, global team comes together for an intense, face-to-face sprint of getting things done. All Hands isn’t just about icebreakers and team building – it’s about collaborating on new cross-team ideas, about jumping into new projects, and about pushing beyond the comfortable boundaries of one’s existing work. As a new Mozillian, it was an invaluable opportunity both to meet new colleagues and to learn more about how the Gigabit Fund and Hive Chattanooga fit into Mozilla’s larger mission and our goal of engaging 10,000 Mozillians in 2014. To reach 10,000 contributors, it’s clear that our work must be global. To this end, exciting projects like Webmaker and Appmaker are intentionally and explicitly global in scope and will be critical to bringing web literacy skills to new audiences and to engaging broad new communities. But to become successfully and authentically global, our work must also be intensely local. Our programs and projects must be transformed and tweaked to answer the global challenge of web literacy in a way that makes sense in each unique local context, and this is where the Hive model becomes critical to the success of Mozilla’s larger work. Hive is a city-based strategy to share connected learning principles and to teach web literacy in a local context. It’s a strategy that takes Mozilla’s larger projects and goals and translates them to the needs and demands of a given city. It’s also strategy in which there is growing interest as more and more Mozillians across the globe begin to host events and to create communities that are both intentionally global in their focus on web literacy and forcefully local in their responsiveness to local needs and in their engagement with local educators. In response to this ever-growing global interest in the Hive model, I spent most of the All Hands week working alongside colleagues from Hive NYC, Hive Toronto, and Hive Chicago to create the new Hive Cookbook, a guide to building, growing, and sustaining a new Hive learning community. The Cookbook is a work in progress, but, even in its infancy, it begins to answer many of the questions we receive again and again from interested people around the world about creating Hive communities and about the impact these communities can have in cities. One of these questions we must answer for ourselves and for others about Hive is how the model scales. Hive Chattanooga is a thrilling project to me not only because its work serves my much-loved hometown but also because it’s a bold experiment in scaling down. With just over 500,000 people living in the metropolitan region, Chattanooga’s population is 1/5th that of the Kansas City metro area, 1/10th that of the Toronto metro area, and just 1/50th of the population of metro New York. We’re not just a little smaller than other Hive cities – we’re a lot smaller. 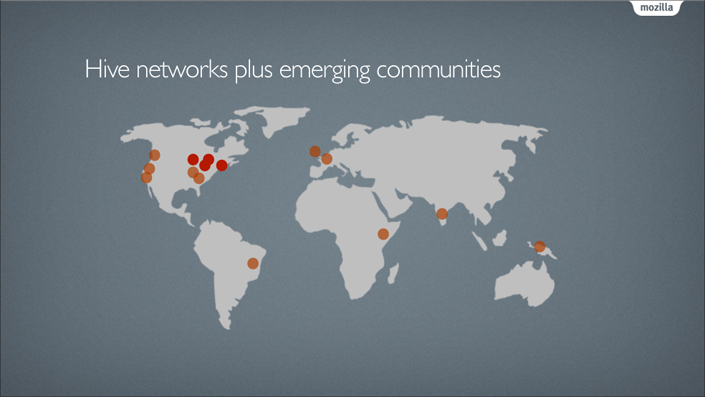 Exploring how a Hive functions at this new scale while preserving both its focus and its potential for impact is important not just for Chattanooga but also for Hive Global and for Mozilla as a whole as we expand across the globe to reach 10,000 contributors in 2014. Thousands of future Mozillians live in small towns like mine, and scaling our programs to fit the unique needs of these communities will open the door to vast new groups of collaborators and contributors. In Chattanooga and in hundreds of communities like it, Mozilla must scale to global by first being local. We must go small to grow big.